Last week I discovered a new breakfast and lunch restaurant, Blue Jasper, quite by accident. My mom and I were out running errands and were hungry for breakfast, but not in the mood for our usual breakfast place or any chains. I took to Yelp and stumbled upon a new place I’d never heard of that had only been open a few months. I pulled up the reviews for Blue Jasper, which numbered almost twenty and average 4.5/5. 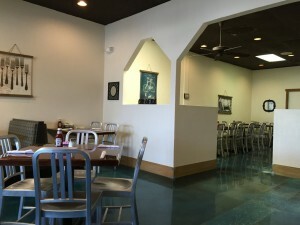 I looked at the menu and found an article from the local paper from April when Blue Jasper opened. It talked about how they wanted to use local produce and resources as much as possible, and ran through the impressive resume of the owner/chef. My mom and I were sold. Showing up only minutes later, we weren’t disappointed. Being mid morning in the middle of the week, it was relatively quiet with only four or five of the twenty or so tables being occupied. The server, Hillary was very friendly, attentive, but not overly so, and was knowledgeable. 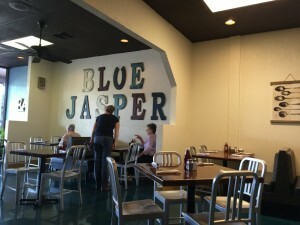 After taking a long time to peruse the Blue Jasper breakfast menu, and decide we were coming back for lunch later in the week, we placed our orders. We decided to order a few different things to try and share. 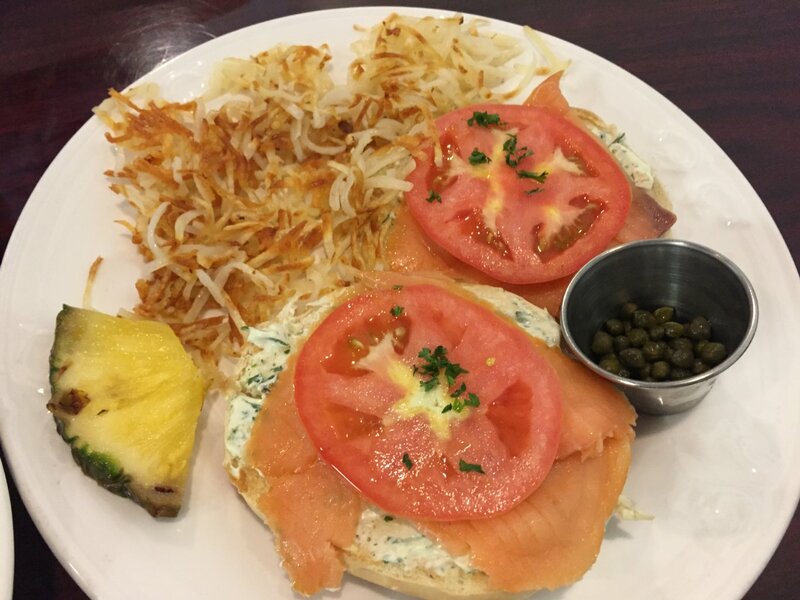 First, we started with the lox and three herb cream cheese on a bagel with tomato. We opted for no onions and the capers on the side. The lox was perfectly sliced and nice and thin with a nice smoked salmon flavor. This was complemented very well with the herb cream cheese. 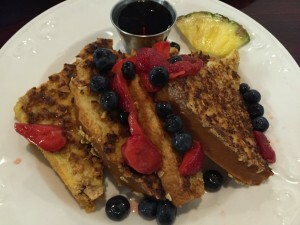 To balance out the savory bagel and lox, we decided to order the crunchy fruit compote French toast brioche with the whipped cream on the side. We both agreed that this was quite probably the best French toast we’d ever had. It didn’t need butter, we used a touch of syrup, and I used a little of the whipped cream, but the berry compote was perfect served cold over the warm French toast. I am assuming the crunch came from cereal or oatmeal on the brioche toast added after an egg wash. 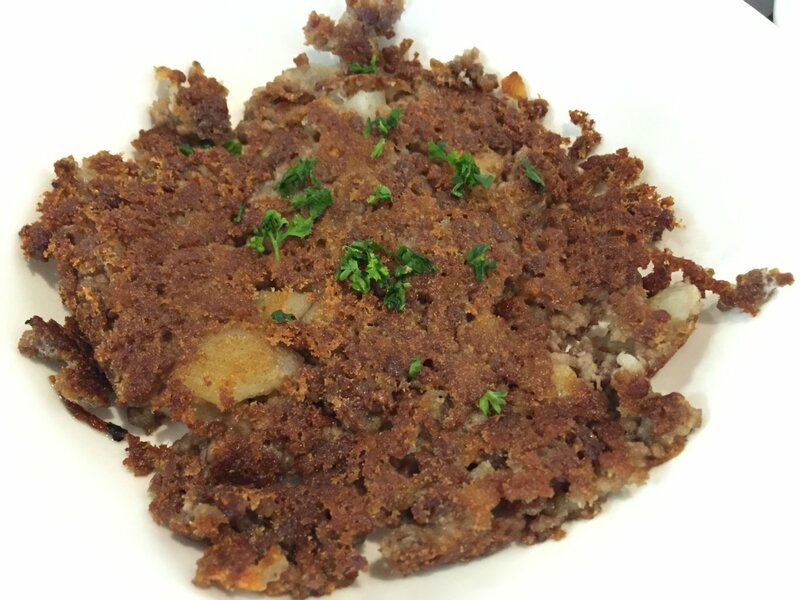 I also chose to give a side of corned beef hash a try. Now, I am very particular about my hash. I do not like salty things, and oddly enough, corned beef is very salty by nature. So I don’t ever want salt added, and I’m not a fan of peppers in my corned beef hash, which a lot of places like to try to sneak in for some reason. This corned beef hash at Blue Jasper again was possibly the best I’ve ever had. It was perfectly seasoned, not salty at all, but still flavorful. I felt a little bad trying some with a dab of ketchup like I usually do. The food was all fantastic with great flavor and nice presentation. 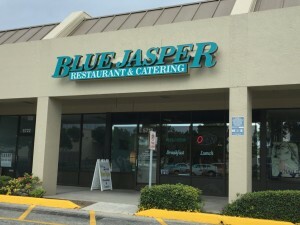 As promised, we returned to Blue Jasper for lunch over the weekend and were not disappointed! We had the duck confit sliders, and their extraordinary grilled cheese. 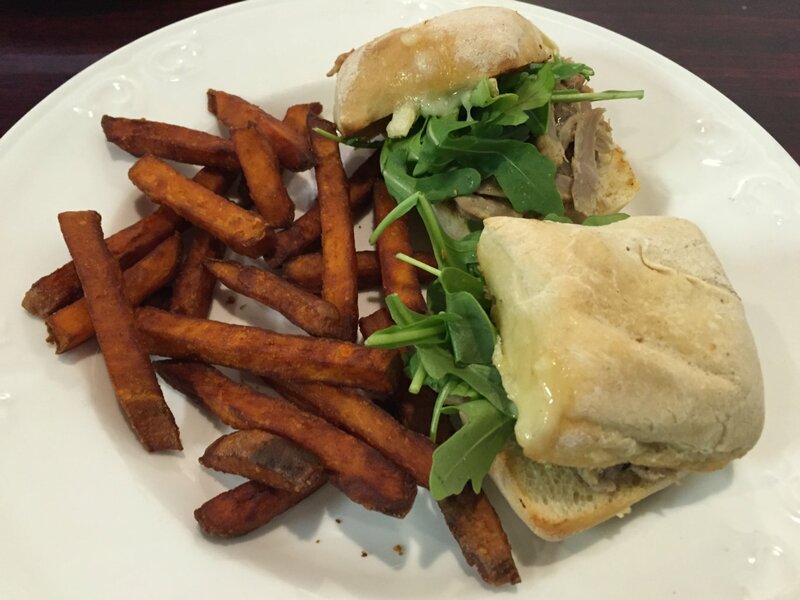 The sliders are served on sour dough bread with brie, arugula, sweet orange rinds, and bacon aioli. 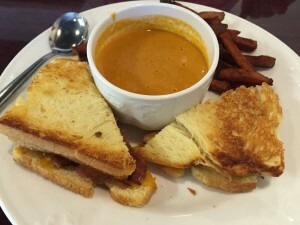 Served with tomato bisque, the grilled cheese has smoked bacon, apple butter, grilled apple slices, and smoked cheddar on brioche. Neither made it home for leftovers, but we did have some extra of the yummy sweet potato fries that made a great snack later. All in all this is a great new spot, and I’m so glad we found it. We will now be adding it into our regular rotation of restaurants. They are open Tuesday through Sunday 7am – 3pm, and also offer catering. 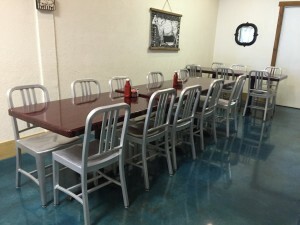 There are vegetarian, vegan, and gluten free options, as well as vegan/gluten free options. If you are in the Sarasota or Bradenton area any time soon, make sure to hit up Blue Jasper for either breakfast or lunch.